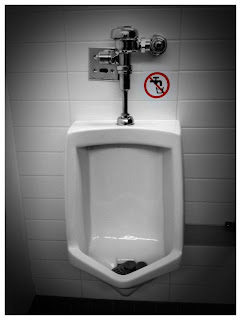 bigheadtaco.com: No Drinking from Urinals? Is this what the sign means? No drinking water from urinal? Guys, we know how urinal water flushes correct? The water runs against the back wall of the urinal, making it impossible to collect the water. Even if one had the desire to get a cup of water from a urinal, how would one accomplish this task? I'd like to see someone try. Maybe this sign is a dare? "We dare you to try to get water from this thing!!"